This unique weight training program is designed specifically for GROWTH, and you’re about to discover all the interdependent principles that help maximize muscular hypertrophy. T.H.T. 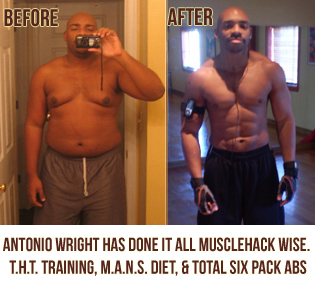 is designed specifically to FORCE your muscles to get BIGGER; it’s that simple. It’s like this: Your muscles are comprised of individual muscle fibers. Making those individual fibers thicker is what muscle growth is. Any effective bodybuilding system MUST be designed in such a way that forces your body to increase the diameter of those fibers. T.H.T. has been so successful that I have had hundreds of success stories land in my inbox from all around the world. All testimonials are 100% genuine and are not solicited. There is a point in a set where the body’s ‘Growth Mechanism’ is activated; stop before this point and NO muscular growth is stimulated. This point is also sometimes called ‘Overload‘. In order to force the body into making your muscle fibers thicker, you need to give it a damn good reason! 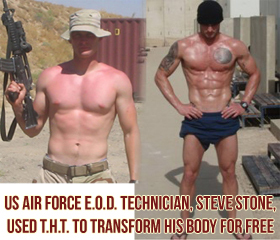 Training WITHIN your existing strength levels does little to nothing to achieve this. Let’s put it simply: If you know you can get a maximum of 12 reps on a given set and you stop at 11 or lower, you did nothing to stimulate a size and strength increase because you merely trained WITHIN your existing strength level. Remember, muscle growth is a DEFENSE MECHANISM. The training you perform must be perceived as a THREAT by the body so that it not just compensates for what you did, but OVERcompensates and builds more muscle as a defensive barrier. All intelligent muscle-building programs take the approach I’m advocating. 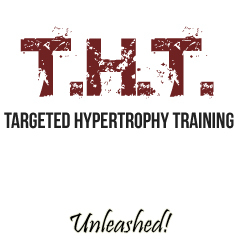 THT, Max-OT, the various High Intensity systems from Mike Mentzer, Ellington Darden, and so on, all take this approach. If you’ve ever been sold on the idea of “Total Volume“, or that training to failure “Fries your CNS“, I’ve covered both those points more thoroughly in the free book I give away on my site (enter your name and email at the top-right of this page to get it). So we’ve already established that a high intensity stress is necessary for stimulating growth. But just how MUCH work should we do i.e. how many sets? This is the issue of volume. It has been established that growth can be stimulated from just 1 set, if that set is brought to the point of muscular failure. These studies      concluded that 1 set was just as effective as multiple sets in increasing muscular strength and size, if these sets were taken to a point of muscular failure. Now, not to confuse you, but consider this meta-analysis . It concluded that multiple sets will produce more growth. Specifically, 4-6 sets can result in 40% greater hypertrophy. Yes, 1 set to failure DOES produce some growth. However, it is my position that MORE growth stimulation will be the result of additional high-intensity sets. However, there is an absolute LIMIT to the amount of growth that can be stimulated in any one workout! 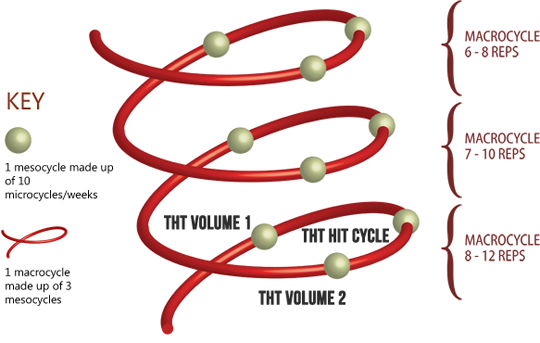 The THT volume cycles typically involve an average of 6 sets to failure for each body part. Any more sets will not produce more growth, but will simply result in a longer recovery period and therefore a slowing, not an acceleration of muscular growth. Which one of these approaches will you be doing in THT? Both. This forms the basis of our different THT training CYCLES. (2) Stimulate more growth in each body part with multiple sets, but only hit each body part once a week in a 5-day split. Why can’t you perform multiple sets per body part and STILL hit that body part 3 times a week? Because the more VOLUME you employ i.e. the more sets you do, the longer your body needs to recover and grow. Train that body part again before it has had a chance to make this adaptation and you will NOT grow. You’ll be OVERTRAINING and actually working against yourself! I coined the term PEAK OVERCOMPENSATION POINT to explain this (POP for short). Overcompensation in this context simply means growth; the body putting back more muscle than was there before the workout. And remember that you don’t overcompensate (grow) until you’ve finished RECOVERING. POP is the period of time it takes for your workout to produce MAXIMAL GROWTH and BEFORE the muscle starts to ATROPHY (get smaller) again. Any adaptation can return to a genetically determined, pre-training state if the stress is not maintained or developed properly. So what does it all mean for your THT workouts? This means that you will train for 10 weeks with a 5-day split workout, working 1-2 body parts per session Monday to Friday. You will then take a week off for additional systemic recovery. You will then start another 10-week training cycle performing a 3-day per week full body routine. Take a week off then go back to another 5-day cycle. So now we’ve covered the 3 fundamentals of bodybuilding science. Yet they count for NOTHING if you get this part wrong. …seek to increase the amount of weight and/or reps completed during any given set in each successive workout. So if you completed 9 reps of 50lbs to failure on your first set of Cable Preacher Curls, next week you must aim to reach failure on the 10th rep or higher on the first set. When you can complete 12 reps at 50lbs, you increase the weight for your next workout. If you can’t complete at least 8 reps, the weight is too heavy and you should adjust and go lighter (assuming you are training in the 8-12 THT rep range). Simple. During your workouts there is a window of opportunity in every set in which to stimulate the body to build muscle. We specifically want our body to make the ANAEROBIC adaptation of increasing the size of the muscle fibers, in particular, the fast twitch fibers. What I mean by the Anabolic Window is that there is a certain duration that a set should last to ensure that you are actually stimulating muscle growth. You will sometimes hear this referred to as ‘Time Under Tension’ or ‘Time Under Load’. In THT we understand that muscle growth can be stimulated from sets lasting anywhere from as little as 20 seconds right up to about a minute long. (90 seconds is a little bit too long in my opinion). For each and every set you’ll pick a weight that causes you to hit failure anywhere between 20 and 60 seconds. Will ensure that you are not fully recovered between sets. The high fatigue element of very high reps demands unusually long inter-set rest periods if you want to be at your strongest in each and every set. Now let’s consider very low rep ranges (around 4 reps per set and lower). This is also not optimal for those of us specifically training for size gains because although you will recruit the requisite muscle fibers and limit fatiguing lactic acid, something will NOT be optimized – “Rate Coding”. Rate coding is simply the FREQUENCY of the signal that is sent to the motor units to contract. Increased coding means a higher frequency of signals. A higher frequency allows the muscle to generate more FORCE. 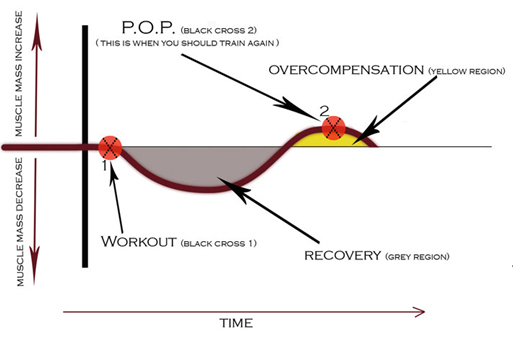 Training at very low rep ranges or a low ‘Time Under Load’ doesn’t give this a chance to happen. 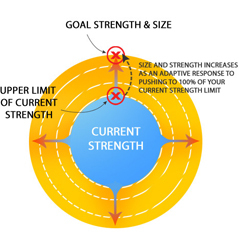 THT will always target that sweet spot in the middle and optimize your potential for growth! If you are training in the 8-12 rep range as recommended in THT and by the National Strength and Conditioning Association , you’ll notice that your sets last anywhere from 24 seconds to 36 seconds long. In other cycles of THT you will work within a 6-8 rep range. This will force positive failure anywhere between 18 and 24 seconds (assuming the same cadence as above). In the H.I.T. cycle sets will terminate around 40 to 60 seconds. Additionally, we also know quite conclusively from this review paper  that the OPTIMAL range for building muscle is around 30-60 total reps per bodypart per workout. All THT cycles will have you training with 5 to 6 sets per body part with 6 reps per set at the lowest (with the exception of deadlifts), and 12 reps at the highest. This brings you in at 30 total reps at the lowest, and 72 total reps at the highest. Judging by the above review paper, that’s pretty much perfect! The best thing you can do between sets is nothing. Just rest up and get your breath back. Also, these rests should be lasting 2 or 3 minutes. They tested the maximal strength of all groups before the study, 8-weeks through, and after the full 16 weeks. Leg presses and bench presses were used to test both upper and lower body strength. So if you’re not completely new to bodybuilding, you’d be much better off resting longer between sets since increases in strength correlate positively with muscle size. This amount of time allows the recovery of intra-cellular energy stores in the muscle. It is also adequate for flushing out any lactate that has built up from previous sets. This enables us to keep up our high level of intensity throughout the entire THT workout. Macrocycle – A period of 3 Mesocycles i.e. 3 x 10-week cycles. So every week of THT training is a Microcycle. Each and every Microcycle should bring progressions i.e. an increase in weight and/or reps in each of the exercises you perform. After 10 microcycles, put the weights down and rest for a week. Then go on to the next THT cycle. For example, if you were doing the THT Volume 1 routine, you can come back with the HIT routine (the order is not important). After 10 weeks take a week off and do THT Volume 2 (all these cycles are fully laid out in my free THT book, go download it at the top of the page). Now it’s time for another week off, but this time it’s different. You’ve just performed 3 Mesocycles of THT, which is known as a Macrocycle. Here’s the important point: After a full Macrocycle has passed, you will change to a different THT rep range. You will then begin a new Macrocycle and perform all 3 Mesocycles in that new rep range. To help you select the correct weight for each rep range, I’m giving you a free program that will do just that. Simply input the weight and reps you most recently used for each exercise and the calculator will tell you the weight to employ for all of the THT rep ranges. Download it here. Web version here. The following diagram summarizes the above and shows you how to keep progressing for years to come on THT. For example, if you start with THT Volume 1 at 8-12 reps, you might want to move on to THT HIT at 7-10 reps afterwards. Your last mesocycle being THT Volume 2 at 6-8 reps. This is perfectly ok. 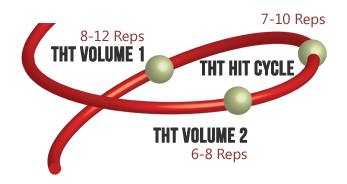 When you commence your next Macrocycle again with Volume 1, you’ll use a different rep range this time, like 7-10 reps, then 6-8 reps in the HIT cycle and so on. The only time that you have 100% of your strength intact is at the very start of a workout (after a sufficient warm-up). This being true, we can then say that you should begin each workout with the heaviest weight you can lift. With each successive set you make further INROADS into your strength. By the time you get to that last set, the weight you lift won’t be the heaviest weight you can handle in that exercise. Perhaps by this stage you’ll only have 88% of your max strength intact. So how should you train? You then hit a particular body part with the heaviest weight you can handle to positive failure (in your selected THT rep range). Take a 2-3 minute break, reduce the weight a little, then do the same again. How much lighter? Well it depends on the amount of load used. If you’re dumbbell bicep curling 20kg, you’ll only need to drop by 1-2 kg’s between sets. If you’re benching 100kg, you’ll need to knock off anywhere from 5 to 10 kgs between sets. Generally speaking, a 5-10% drop usually works best. Creating these inroads triggers the body to adapt and bring your strength not just back to 100%, but >100%. This is OVERcompensating. So by the time you perform this same workout again, you’ll notice that your max strength has now increased i.e. you’ve gotten stronger and can handle more weight and/or reps.
Now all you have to do, my friends, is keep doing it! Keep progressing. Adding more weight to the bar and/or performing more reps in successive workouts is the very thing that guarantees muscle growth. If you’ve been led to believe that you can stimulate MAXIMAL growth in ALL the muscles of the body with compound exercises only, you’re mistaken and are not training optimally. You might be able to “work” all those muscles, but not all muscles included in a compound movement are being trained to their maximum potential; and oftentimes nowhere near it! Before I go any further, let me make it crystal clear that compound movements are an absolute requirement! I’m simply arguing against using them exclusively at the expense of isolation movements. You’ll even hear guys advise you to steer clear of bicep curls because you can ‘overhead press‘ your way to big biceps! I’ve read a lot of these types of articles that bash isolation exercises. They all sound the same. If a reason is ever given, it’s usually that compound exercises produce a more anabolic environment in the body with higher levels of Growth Hormone, Testosterone, and IGF-1. True? Yep. 1 set of squats will result in higher levels of anabolic hormones than a set of barbell curls. But so what?! Who, in their right mind, is recommending solely isolation exercises? Wouldn’t a workout consisting of BOTH compound and isolation exercises not produce an even MORE anabolic environment? However, you’ll now see that this isn’t even the real issue. I would contend that a THT workout is one of the BEST workouts out there for raising levels of growth hormone and testosterone. But does it make any difference to hypertrophy anyway? The researchers basically wanted to determine whether or not training-induced elevations in endogenous hormones enhanced muscle strength and hypertrophy. After 15 weeks of training, the “high hormone” group did not experience increased strength, nor additional muscle hypertrophy. movements, is LOADED with erroneous assumptions and is quite simply incorrect. But I want to reiterate this: compound movements are essential! It’s non-negotiable; you HAVE to do them. However, believing that doing squats will have an overspill effect to the rest of your body and will produce large biceps and calves is wrong. In short, compound exercises are needed, but muscle growth is also a LOCAL event! That is, if you want large biceps, you had better work your biceps directly! I’ve trained myself and others for years. Trying to tell me that local muscle growth doesn’t happen is like telling me the sky is brown. (If you’re still not convinced, just download the free THT book and go to the section on compound and isolation exercises where you can learn more). 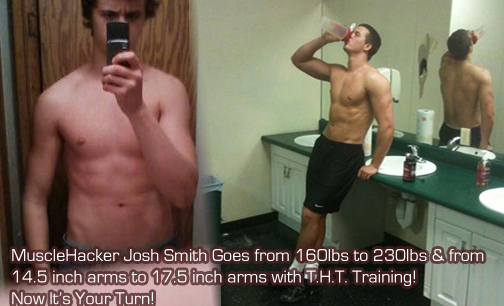 You can go and download the THT workout logs right now from here. As well as all of the above, the actual workouts themselves are included. Stop waiting around. Stop going from one ineffective program to the next. Stop theorizing about all of this (that’s my job). Just start DOING it! Trust me, you’ve everything to gain and nothing to lose. Think about it. How’s your current plan working out for you? How much strength and muscle have you gained in the last 10 weeks? Now project that out to the next 10 weeks. Are you satisfied with that!? Find out why over 30,000 people have downloaded THT. And YES it’s 100% FREE. No BS. I started this site to also start a community. So make sure you join us on Facebook and at the forum. Single vs. multiple sets of resistance exercise for muscle hypertrophy: a meta-analysis. Krieger JW. J Strength Cond Res. 2010 Apr;24(4):1150-9. The influence of frequency, intensity, volume and mode of strength training on whole muscle cross-sectional area in humans. Wernbom M, Augustsson J, Thomeé R. Sports Med. 2007;37(3):225-64. Strength increases in upper and lower body are larger with longer inter-set rest intervals in trained men. de Salles BF, Simão R, Miranda H, Bottaro M, Fontana F, Willardson JM. J Sci Med Sport. 2010 Jul;13(4):429-33. Epub 2009 Oct 7. Elevations in ostensibly anabolic hormones with resistance exercise enhance neither training-induced muscle hypertrophy nor strength of the elbow flexors. West DW, Burd NA, Tang JE, Moore DR, Staples AW, Holwerda AM, Baker SK, Phillips SM. J Appl Physiol. 2010 Jan;108(1):60-7. Epub 2009 Nov 12. P.S. Just look at some of the results that have been achieved by people all round the world without costing them a penny! More testimonials here. And guys are constantly posting up progress pics at Facebook. I started THT 21 weeks ago. After 10 weeks of the volume training I switched to H.I.T. During H.I.T. I went to failure, followed the program as instructed, but never felt “spent” or any muscle soreness. It felt almost like a vacation. When I restarted the volume training (8-12 rep range) last week, I could barely move after each day’s workout. I’m wondering if high intensity, one set to failure is conducive to my body type (long limbs, historically lean). Or, is muscle soreness an over-rated indicator of a “good” workout. Gains so far are hard to judge given the short test period so far. I think your work awesome. No doubt the best bodybuilding advice on the internet today, keep it up. Unfortunately, I did not receive the email for the THT 4.0 could you send me a link? I also second what Sammy posted. Great article Mark. It really got into the details of THT. I only started 4 weeks ago and the gains I’ve seen have been fantastic. I’m doing the TSPA diet and despite it being a cutting diet I’m still making gains and getting stronger while cutting away the fat. Sincere thanks. I have 2 weeks left on H.I.T. then onto T.H.T. 4.0!!! Cannot Wait!! Thank You Mark!!! you dont have to feel any kind of stiffness the next day, just train to failure and beat the last workouts, if you are gaining in reps/’weights then you are getting stronger, you will feel more stiff with the volume exercise hence there is more volume to do and that builds abit more lactic acid, the HIT is one set each, just push extra hard each time. also sammy, if the HIT feels like a vacation to you then you simply just arent training hard enough, when you think you have reached failure that would be your mind giving in first, not your muscles. the real resistance is not moving the weights its the resistance of your mind. when you think you cant do anymore thats when you should atleast be 3 quarters of the way through your set. like mark always says, train hard!! THANKS to Mark for producing this and I have now completed all your routines. I always enjoy the workouts variety and knowing what my goals are. I recommend them to anyone starting out or looking to make real visible gains. I’ve used all your THT routines exclusively and learnt so much from you and reading your articles. I don’t have heroes but if I did, Mark, you would be it!! Not only for helping me build muscle but also the side effects it brings : confidence, self esteem, health, happiness and a great looking future. Priceless gifts. I owe you a lot. PS. can’t believe what I’m reading about the HIT routine. It is the hardest workout I have done and by about halfway through each workout my body feels totally blasted and wrecked (in a good way). If it feels like a vacation you are certainly not doing it right. Oh I did work out to true failure. I meant in comparison to the volume training it felt like a vacation; not a vacation from working out. It’s likely a mental thing. The workouts are shorter and I’m very used to moving to another set or two of the same exercise. I have read (for what it’s worth) that longer limbed, (naturally) leaner bodies don’t respond as well to HIT training compared with volume. Here is my issue. During the HIT phase, I hit chest three times a week for a total of exactly three sets. During volume training I hit chest only once per week, but I hit the upper, mid and lower chest for a cumulative total of 10 or 12 sets. Both phases are to failure, but with slightly different weight ranges (due to differing rep ranges). During HIT, moving from one body part to another, even going to failure didn’t seem to “push” me. Granted, I did increase weights lifted over the 10 weeks, which would suggest gains. Hey Mark, whats your take on pro hormones.